Rhonda had a problem with a defective wheel on her TravelScoot, so Alan and Dave (our Scooter Wrangling husbands) got together to change it. Dave had tried to change it alone first, but he either didn't have enough hands to do it, or couldn't get enough torque to get the wheel off. If you look at the first picture closely you'll see that the wheel is split. The split is all the way around and goes to the core. 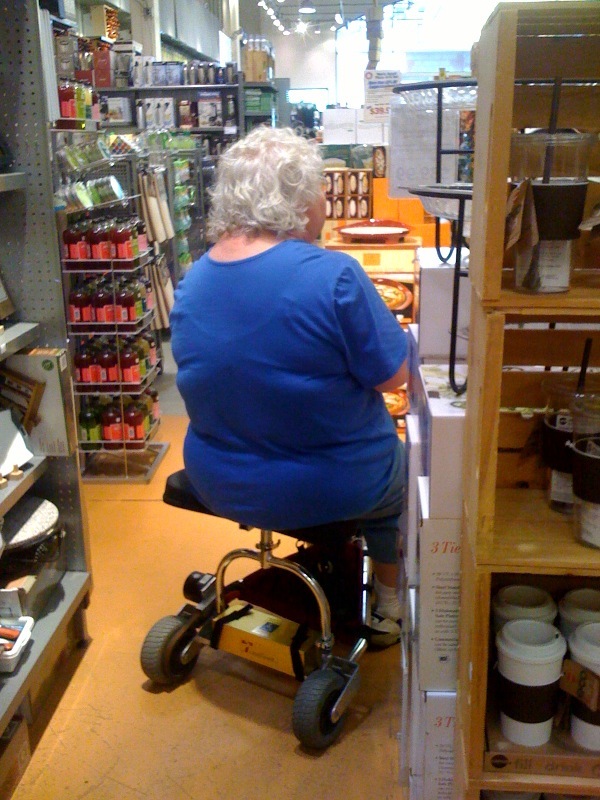 Fortunately she was still able to use her scoot, even with the split wheel. If you haven't heard the term "Scooter Wrangler" before, these are those wonderful souls who help the less mechanically inclined scooter users with maintenance. They're also wonderful at lifting scoots over obstacles, or putting them in and taking them out of the car on shopping trips. Yes, Rhonda and I can both do those things alone, but it's nice to be pampered sometimes too! From start to finish this whole process took 5-10 minutes. I was just snapping a lot of pictures so I could show them to you all. Or since I'm from Louisiana I should probably say "y'all!" The first picture here is Alan, trying his hand at loosening the bolt. He's using a hex key, and I'm not sure if it's one that came with the scooter toolkit or one of the ones he brought from his own hex key set. When that didn't immediately work he gets a closer look. Then Dave got involved too. In the last picture of this group you can see a hand on each side of the wheel. I believe he has 2 hex keys, one in each hand. Now they're trying a little WD40, to see if that will help loosen things up. 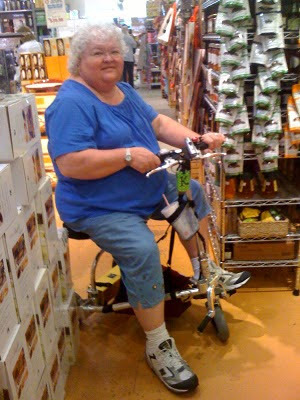 As Rhonda pointed out to Dave, these scoots are factory assembled, and everything is put together nice and tight. That's a good thing, except when you're trying to change the wheel. The second shot in this set shows you the second hex key. To release the bolt that holds the wheel on, you turn the hex keys in opposite directions. Can you see that it's 6:30 by Alan's watch? They're motivated to finish, because when they do we're going out to a Mexican restaurant. I think I heard one of them grunt in the last picture in this section, but there was no cursing involved. They've gotten the bolt loose, but are now trying to remove it so they can put the new wheel on. It doesn't want to come out just yet. Dave has gone in the house to get a screwdriver and hammer. Alan's got the new wheel in his hand, so success must be near. Just a tap with the hammer and the bolt is out. This is what the bolt looks like. It's threaded on the inside. Now Dave is tapping the bolt back in, and they tighten everything back up. 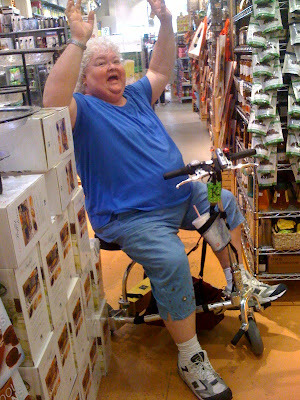 Dave took the scoot for a test drive and it worked perfectly. I took the plunge - I went on a cruise last week. I learned some things about myself. I'm not really a cruiser person - seasick. I'm not a lobster person - must be an acquired taste, I didn't think it was all that big deal. She zipped right up the main gangplank without any trouble. I did have to give her a little help up the short one leaving the ship as it was at a 45 degree angle. She got to be in her first conga line. She went dancing and into the casino - but I wouldn't let her gamble as she's not old enough yet. She roamed around a foreign country, but we both agree that unless you really like jewelry, Nassau town has too bumpy sidewalks to make it worthwhile. But the most fun was going out late a night after everyone was asleep and doing doughnuts out in the ocean breeze on all three of the sunning decks. Glorious! As for getting her into the stateroom, I got one of the regular rooms, but as Vroom is a junior size, she rolled right in without any problems. 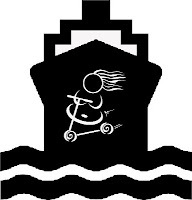 A word of warning for anyone going on the Carnival Fantasy: watch out for the speed bumps. There's places were they can shut off sections of the hallways, and at each one is a metal strip to secure the bottom of the door. Most aren't that bad but I hit one (literally) that needed some extra gunning of the throttle to get over it. Also some of the bottom edges of the doors going out to the decks have a lip to help keep water out. Take a running start. The crew is quite trainable. They soon learned to move their toes out of my way and to not even try to separate me from Vroom. Yes, I rode her all the way to the table, I saw way to much envy and didn't want to chance losing her. One more adventure I couldn't have done without the TS - those ships are huge! You & I have corresponded several times before. I read all the posts on your blog with great interest because I have cerebral palsy & arthritis & am past 60 years old & figure that the day will come when I can no longer walk very well. 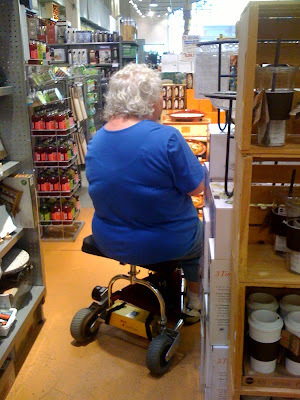 I really enjoyed Rhonda's post about walking about still walking as much as she can when she can & using the Travelscoot when pain might keep her from doing what she wants. 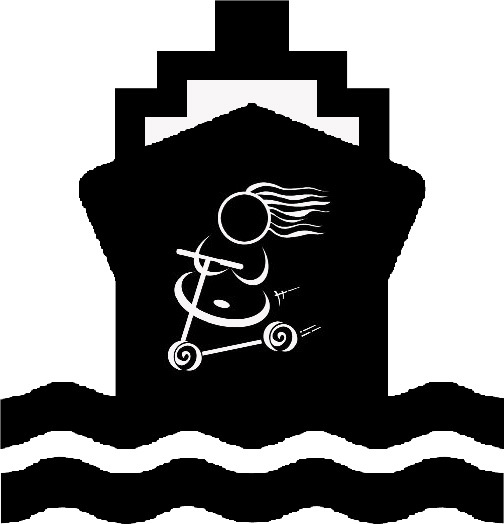 I doubt that the Travelscoot itself will ever be for me, as I have a strong feeling that it will tip too easily for someone with my balance issues, but I do understand that, stubborn & determined to be independent for as long as possible as I am, the day when I need a mobility device is getting closer. I thank Rhonda for sharing her perspective with us & for giving me something to think about. Please keep inspiring us with your adventures. Most people don't understand that if you have a scooter, you have some mobility and that mobility depends on where you are, where you are going, and the pain level of that day. I don't use mine in my house because if I start really hurting, I can lay down or take a hot soaky tub. Something I can't to a work or while out shopping. Also, at home I've got walls handy to use as a stablity device if I need it. I've also noticed that the more I use it for the long hauls, the more I'm able to do the short ones. It's like I'm not wearing my legs out and, thus, giving them more walkable longevity. So my 'yard stick' is pain level, distance, and will there something I can grab if my legs suddenly collipse? OK, you can add: just how ornery am I feeling today? And yes, I like to ride sometimes just because it's FUN! Good post. We need to remember that a TravelScoot is just a tool, like a cane or a chair or a car. It helps you. It isn't something that you lean on. If one can walk, they walk. When they need help, they use a tool. For some the reality is they will be on it constantly; others it is a fill in. Doesn't matter. Accepting our physical limitations is a major step for some. Don't feel ashamed if you need help, whether asking someone to hand something to you or to get on a scooter. We do what we must to get along. My sisters Georgia, Kay, and Rae are all together right now, and this afternoon they were having an adventure in the Chef Central store in Paramus, NJ. I'm jealous because chef Lidia Bastianich is there right now. I love her show. Judging from the first picture I suspect they're having a ball, or at least Kay is! Hopefully Georgia and Rae will appear in future pictures. I believe what we're seeing mounted on the handlebars is a headlight. I'll request a closeup. In a recent conversation a friend declared that she was torn about getting a TravelScoot because while there are days that she suffers, and it would be convenient on occasion, she didn't need a scooter/mobility device as much as I did and feared that getting one would mean that she had given up walking. This struck me odd, since I surely haven't given up walking. In continuing our conversation, I realized that she was comparing her need to mine as though I was the measuring stick for her ability. Wow, that is a lot of power to assign to someone else. After a little thought, I realized that as a defense mechanism, I have been very vocal about my need. Also, I have posted a lot of pictures of me using my scoot and told a few stories. In truth, I don't always use my scooter. My scooter use is directly related to my pain level on any given day. 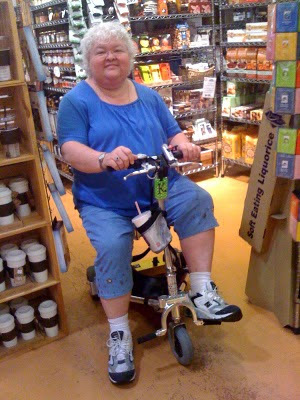 There are some days that I will use my scooter for a ten minute run into the grocery store that I could probably "endure" on foot, and there are other days that I choose to walk a great distance, if my pain and asthma are managed and I feel up to it. 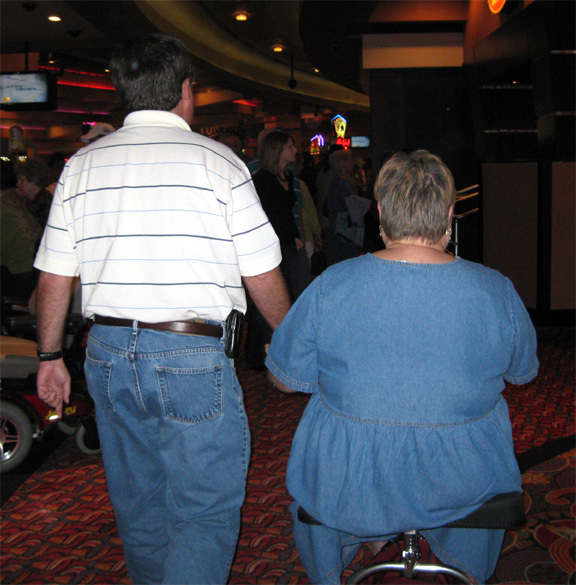 Although it is common to see my husband walking next to my scooter holding hands with me, I still do enjoy walking close to him and holding hands, so sometimes I do this instead of riding. I guess what I am trying to convey is that I have customized my scooter use to suit my needs and desires. Just because I have one doesn't mean that I have to use it all the time. 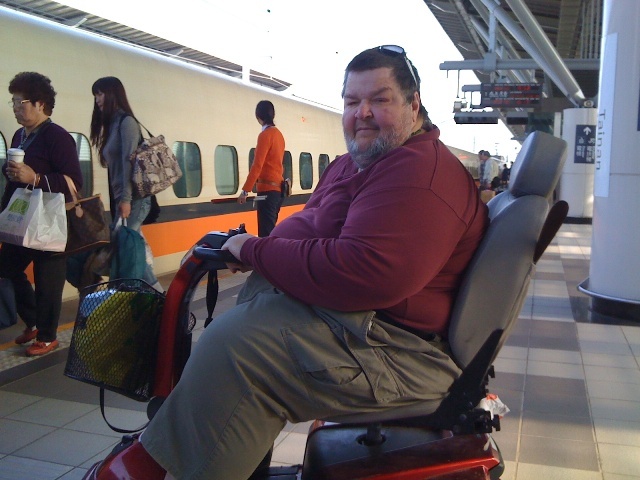 However, having made the decision to use a TravelScoot now has probably extended the time before I have to have a mobility device. I do however, fully intend to keep walking when I can and where I can, right up until the end, and using my TS in between for need and pleasure. Since our conversation, I no longer feel that I have to justify my current need so vehemently and instead will start telling people that I fully intend to keep walking and have never even considered quitting. My TS is here to serve a purpose and that purpose is to improve my quality of life now and keep me active and vital, because I deserve to be, not to replace walking. Everyone has different needs just as we all have different bodies. How do you use your TravelScoot and do you sometimes choose not to use it? From Elizabeth: If you have a response to this post and would like to send it to me via email, my address is elizabeth@ifisher.com. 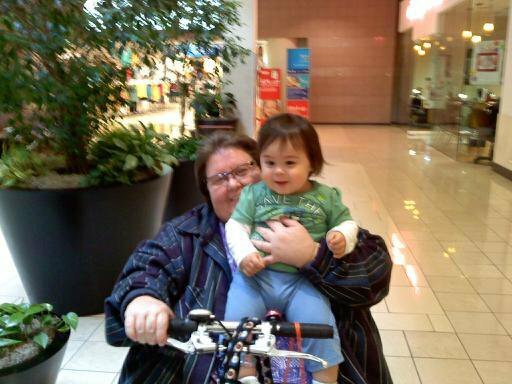 These precious photos are of Cynth and her grandbaby on a scooter adventure at the mall. They're just adorable! What follows is something Dean gave me permission to post. The scooter he's talking about here is a Celebrity X. He just got his TravelScoot this week and promises he'll share his adventures with us. 5:00 AM: Sunday Seoul Korea time. Dean, up, showers and packs bags. 9:00 AM: The check in people alerted me that they won't let me take my scooter to the gate and insist I be taken in a wheelchair so off I go needlessly. I have learned to not disagree...just do whatever happens. They take me up to the Business class lounge and I sit and wait. 1:00 PM: Arrive at Tokyo airport. Up rolls my mobility scooter. An older guy, bald with buck teeth, appears and he is to be my guide. I crank up the speed and we sprint along at 6 miles/hour. I wondered if he would tire but he was running along happy and not even breathing heavy. He said, "My friends call me Rabbit.. haha.. bald and big teeth and I'm fast." We literally went a mile and he never cracked a sweat. 4:00 PM: Down to the gate and waited to board. A young stewardess came up to me and it was very obvious she didn't know what to say to me so she looked at me and said, "I like your sunglasses".....damn, I used to make women blush and now they like my sunglasses. Onto the plane I went and my scooter, ever beat up by this trip, went slowly away with all 5 of the technical people from the airlines watching it warily. I settled into my seat for the 12 hour flight. Luckily I was sitting next to one of Steve Job's executives from Apple and we spoke about Macintosh and I-Pads and I-pods for hours over good food and drink. 9:00 AM: When we got to San Francisco they had another young person meet me and an old man who informed me he must push me in a wheelchair.... my mobility scooter mysteriously showed up and I cranked it up and headed up to United for my flight to Phx. The staff there went through the normal "Is that a drycell?".... I got on the plane and gladly flew home. When we landed an obnoxious United person came on and screamed "Get off the plane. We are going to reload the plane." I explained I was waiting for my mobility scooter..... even her fellow stewardesses were offended by her rudeness to me. I was too tired to even respond; possibly would have cried which is sort of embarrasing at 59. Went down, found my bags, and outside sat my wife..... home at last... I'm HOME. Elford sent this in to give us all a smile. Happy Saturday! I called your house the other day and was told you were down at your favorite biker bar with some friends. I wasn't sure where that was, but was told I wouldn't have much trouble finding it. Elizabeth and all, we'll shortly know how a TravelScoot holds up worldwide as I have ordered one to supplement my Celebrity X Scooter. In 2010 I've been around the world twice on business and my traditional scooter has racked up Paris/London/Hong Kong/Taipei/Seoul/Tokyo/Vancouver with also many US cities. I decided it would make it easier as I can use traditional cabs instead of having to find the special ones that can hold my 200 lb Celebrity X. The picture was taken recently of me in front of a temple in Taiwan. Melissa called me on my day off to ask a "huge favor" involving a big crowded parking lot, a medical complex, and (if I didn't have my scoot) too much walking. I've never been so delighted to run an errand, especially for someone who has done more for me than I can ever repay. 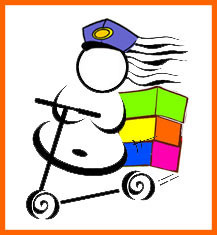 Whoever is writing out the list of all the things we can do with our scoots that we couldn't do before, please add a new entry -- Scooterbabe Delivery Service. I parked at the back of the parking lot under a shade tree, scooted in and out, and drove off to deliver the package. Mission accomplished! Do you have an adventure you'd like to share? Send it to me by email, elizabeth@ifisher.com. Today started off with me and Alan at the Unfinished Furniture Showcase store to check on some shelving we'd ordered. While I was there I visited a rocker I've come to think of in the last week as mine. I'm a very large person, and most chairs are not comfortable for me. This one fits me like someone took my measurements and made it just for me. 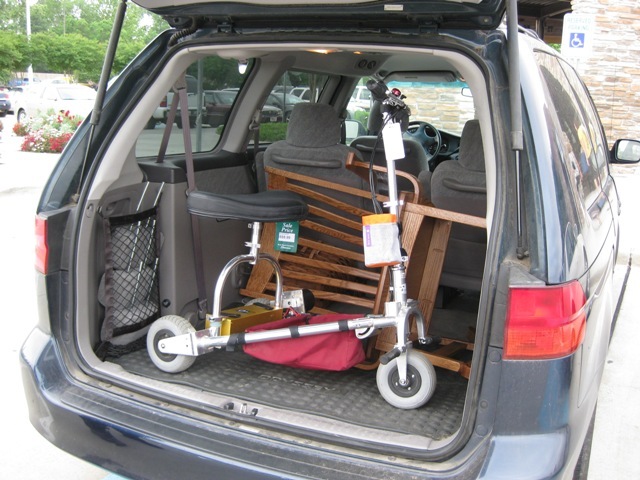 As you can see from the picture above it is now mine AND it fit beautifully in our Odyssey along with my scoot. We also found the perfect spot for it in our living room, in front of the glass doors and with a great view of our skylight. Of course I had to try it out so I sat there rocking and looking at the trees swaying in the wind through the skylight. 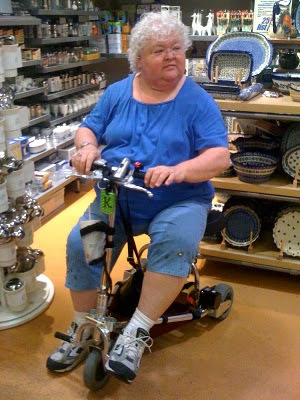 Because of my scoot, I was able to go many places today besides the furniture store. We met two of my sisters for a nice lunch, then went to a big hardware store and then to a grocery store we almost never go in. Sometimes I think we are just in the place we need to be at a certain time. I say that because there was an older man in the grocery store who needed a scooter but didn't want the lift he'd need in order to take it anywhere. I admire him because despite a run in with flesh-eating bacteria in both legs, he was walking around the store wearing special boots and getting his own groceries. He was amazed at my scooter and wanted to know all about it. Tonight my scoot carried me to celebrate Melissa and Greg's second wedding anniversary. Life is good!